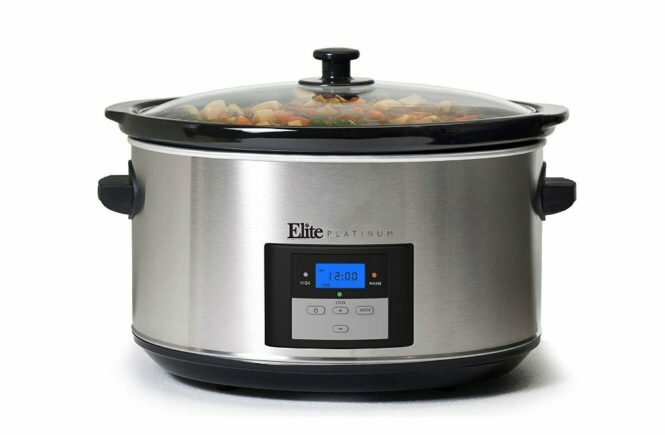 Elite Platinum MST-900D Maxi Matic Programmable Slow Cooker. 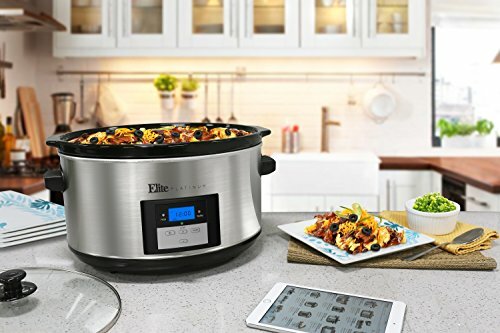 An extra large slow cooker, such as the Elite Platinum 8.5 Qt Programmable Slow Cooker with Timer, is the best choice when cooking for large groups or for family gatherings. They also have the benefit that they can fit a small turkey or a whole beef brisket. But there are even bigger slow cookers of up to 22-quart capacity if you really need to cook big. However, for large families of more than 4 people or very good eaters, The Elite Platinum 8.5 Qt Programmable Slow Cooker will be big enough so that no one leaves the table hungry. For smaller families, those large slow cookers may leave enough to warm up a quick lunch or dinner the next day. Another benefit of very large slow cookers is the fact that even large pieces of pork and beef or other meat cuts fit in well, with enough space to add veggies and taste giving ingredients. Simmering a very large quantity for 10 hours or more will also bring out the best flavors. So what large slow cooker is best for big families? The Elite Platinum MST-900D Maxi Matic Programmable Slow Cooker has a capacity large pot to cook up a great dish for big groups of people. In fact, the capacity of 8.5 quarts may be too big for the average family. The Elite Platinum Slow Cooker is easy to clean due to its dishwasher safe removable stoneware pot that is large enough to fit one entire chicken or a small turkey. It has a digital timer up to 20 hours and a digital LED display to inform you of the remaining time to cook the food. The tempered glass lid secures a tight seal to maintain the ingredients saturated. It has a cool touch handle to prevent burns and easy usage. The Elite Platinum MST-900D Maxi Matic Programmable Slow Cooker has three temperature settings: warm, low, and high. The design of Elite Platinum MST-900D Maxi Matic Programmable Slow Cooker is modern stainless steel and can complement most kitchen interiors. The stoneware pot has cool-touch handles and dimensions of 11.5 inches width by 11 inches length. It is an oval-shaped programmable slow cooker that weighs 15 pounds. The Elite Platinum MST-900D Maxi Matic Programmable Slow Cooker comes with a limited warranty to ensure quality and safety of the products that the Elite Platinum manufacturers. The Elite Platinum MST-900D Maxi Matic Programmable Slow Cooker with 8.5-quart capacity is just right for large families or when regularly cooking meals for groups of people. Cook a very wide variety of meals – pot roast, whole chicken, soup, even cooking up a curry or a chili for 12 people or a Thanksgiving turkey this large slow cooker is a great choice for any kitchen. The programmable function allows for time management as it can be set to up to 20 hours cooking time at three temperature settings – warm, low, and high. The brushed stainless steel exterior, which gives it a modern stylish look can get really hot when it’s in use; the stay cool handles can keep you safe from it though. If you are looking for a programmable large slow cooker that can last for long and doesn’t break the bank, then the Elite Platinum MST-900D Maxi Matic Programmable Slow Cooker is a pretty smart choice.